Offers electronic management of your appointments. You can access a list of your repeat medication and request a repeat prescription. Minimise your trips to the practice – only one visit is needed to collect the prescription. Your request is authorised online by the practice, so you know when it’s ready to collect. You can also view your medical record wherever you are with the FREE Patient Access App. Photographic identification must be provided on requesting access to medical records. 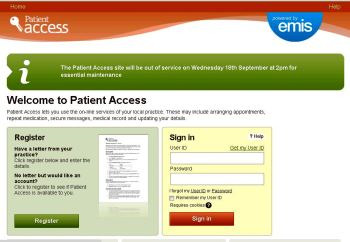 Patient Access: "My own 24 hour Receptionist"